Oh, how we love our tribe… our Flow spinners, our staff, our sister studio members and coaches at Iron Orchid… these people make our hearts beat (and if you want to know how fast, check out our blog about heart rate monitors CLICK HERE!). It is because of this love that we think the tribe needs to expand every now and then. We have added four new spin instructors recently and to say we are stoked to have them on board is an understatement! Please allow us to formally introduce to you Rainy, Rita, Lauren, and Kylee! Hey Rainy! Welcome to Flow! Rainy was one of our own! 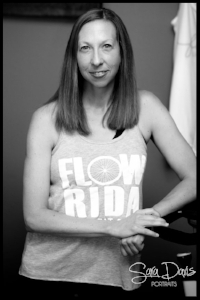 You have no idea how awesome it is when we find out that one of our frequent Flow Riders caught the spin bug and quietly sneaks off to get certified as an instructor… but that is exactly what Rainy did! She is a pretty calm and collected chick and then BAM! - she becomes a power house on the bike. She has extensive outdoor riding experience and Triathlons are her jam. So, if she makes you jump off the bike and run laps around the building… you know why. (We kid! We kid!). Her music tastes are diverse and she has been known to call a playlist “hype” – because she is cool like that. We love the balance she adds to our classes and the fact that she knows what it is like to be on the rider side of the studio is a huge asset. When Rainy is not spinning with us, she can be found teaching Junior High P.E. class. Come visit her soon to check our her vibe! You can spin with her on Monday nights at 5:30p as well as the weekend 9:00a rotation! Visit Rainy's page HERE! Rita… It is ABOUT TIME! So happy to have YOU! It’s true, we have hounded Rita for a while. We knew she would be a great fit. She has a reputation and she is hard to forget! This beauty comes to us with years of Spinning experience. 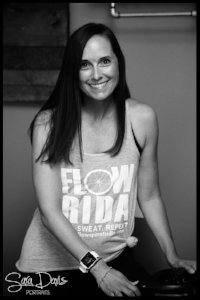 She not only has put in extensive time on the bike, she also teaches Pilates Barre and is a certified group fitness and yoga instructor, as well. Fitness is her game, but it is not all about the body. Rita will also focus on the mind during class and you will be so captivated, you will not even notice how hard you are working. Her knowledge about the body and the way it works is advantageous to new spinners and regulars, alike. Her playlists though… AMAZING! Rita is a music fan in general and she will have you working a beat and a groove in no time. How can you NOT check out her classes now?! Join Rita the 2nd and 4th Tuesday night at 5:30p per month as well as the Sunday 9:00a rotation! For more on Rita... CLICK HERE! Lauren Waymire joins us with over twelve years of Spinning experience! Out of all the fitness classes she has lead or taught, Spinning is her favorite. If her name sounds familiar, it may because she is the sister in law of another Flow family member, Dawn. We may have stalked Lauren just a bit and we are so happy she decided to come along for the ride. She has a Masters degree in counseling and worked in higher education for 8 years before deciding to stay home with her 3 children. Lauren loves to rock a great beat but does not discriminate with her tunes – she is up for almost anything. For now, catch Lauren on Thursday nights at 5:30p as well as the Sunday 9:00a rotation – you’ll love her just as much as we do! To read Lauren's full bio, CLICK HERE! Kylee moves to the platform! and focus on strength and endurance in her classes. She found a love for spinning after missing her days in gymnastics, cheerleading and volleyball. Kylee stresses that we may all have a different reason for working on our fitness and that we may not all look or preform the same. But, to Kylee, it doesn’t matter – she is here to help each rider along. She will make sure that you focus on YOU for your 50 minute ride! Ride with Kylee the 1st and 3rd Tuesday night at 5:30p per month as well as the Saturday 9:00a rotation. To read her full bio, CLICK HERE! Rainy, Rita, Lauren, and Kylee may be our newest additions, but what a family we have here! Our other instructors Dawn, Jayne, Lacey, and Laila are continuing to work the room and bring their “A” game to each class. Reach out to them with feedback, song requests and ideas anytime! After all, our Flow Riders are what makes our head spin round… right round… like a record, BABY! About the Author: Lacey Sonderegger is a spin-a-holic, university communication instructor, mother of two, wife, and friend to everyone. 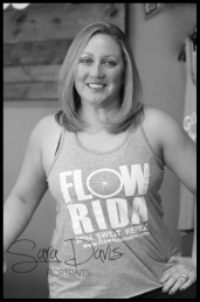 She is passionate about creating lasting relationships in everything she does and helping others find enjoyment in Spinning!